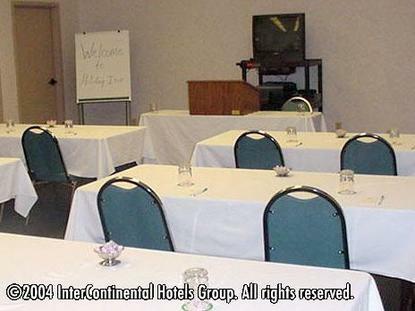 The Holiday Inn Hotel Forrest City,is the only full service hotel in the area. Located between Memphis and Little Rock on I-40. Our property is nestled on beautiful Crowley's Ridge amidst landscaping lush with flowers and trees. Our Holiday Inn is close to Sanyo, Airthem, Boars Head, and twenty minutes from Mueller and Addison in Wynne. Village Creek State Park is just 15 minutes away showcasing 7000 acres of beautiful hardwood trees which show a myriad of colors in the Fall. Two lakes are stocked for fishing. Kids can paddleboat, feed the ducks, play on one of several playgrounds. This is fun for the whole family. This hotel is committed to providing accessible facilities under the American Disabilities Act. If your accessibility needs are not met, please contact the Hotel Manager on Duty. Should you require additional information regarding accessible facilities for guests with disabilities, please call 1-800-Holiday (U.S. and Canada) or contact the hotel directly. For the hearing impaired, TDD service is available at 1-800-238-5544 within the U.S. and Canada.